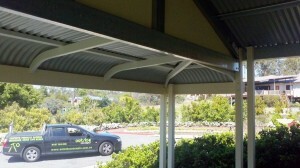 After a referral from a previous customer, this Brisbane carport presented several challenges. The brief was to design a carport that matched the house with a low frontage to minimise the visual impact from the road. Additionally, the existing house had a tiled roof to match and a limited budget. Meeting the challenge, Lorraine and Tony Reeves from Outside Concepts Brisbane South presented various proposals, starting with a timber frame design and finally progressing to a combination of steel and timber. This design had several advantages. The Lysaght C-section steel beams allows for greater spans than timber and is cheaper, reducing both the material and labour costs for the customer. Rather than constructing a tiled roof, which is expensive to frame, a Colorbond Custom Orb roof was chosen in a colour to tone with the house roof, gutters, barge boards and trims. 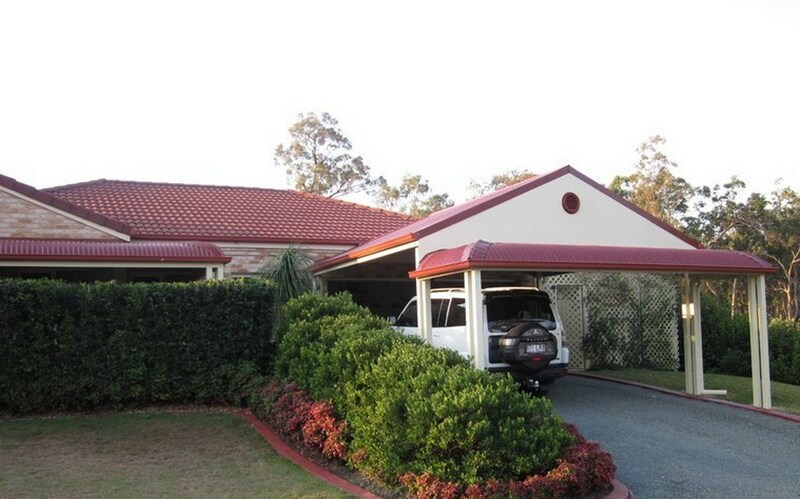 The construction of this double Brisbane carport on the sloping block and working around an established garden at the side provided several challenges for the builder. Curving the rafters to match the house and constructing the bullnose verandah on three sides of this double gable carport were complex components handled with precision by the builder to ensure a quality build. Flashing (or waterproofing) the carport against the house, around fascias and brickwork required the construction crew to work painstakingly. The result is pleasing to all and the customer became Outside Concepts number one fan! They loved their Brisbane carport so much, that they have now commissioned Outside Concepts Brisbane South to build an entrance arbour. We’ll keep you posted on that project in the coming months! Sign up if you would like to receive the Outside Concepts newsletter.